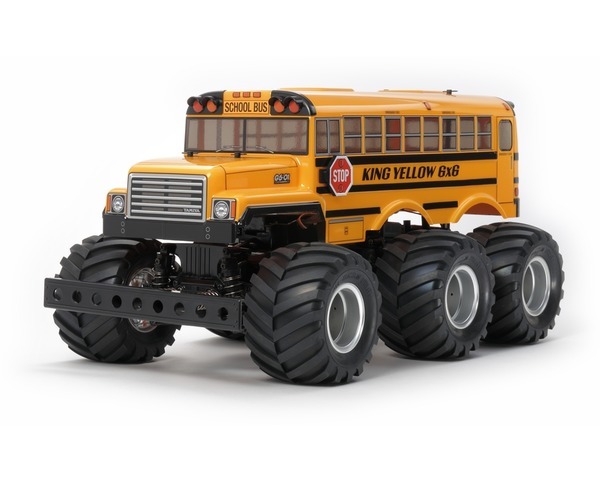 The King Yellow is a 6x6 six-wheeled School Bus themed R/C vehicle ready to pound dirt, asphalt lots and neighborhood streets across the country! The model utilizes a gear-driven 6WD chassis which is partially derived from the capable Tamiya GF-01 wheelie machine. The exceptional drive it provides make for extreme fun while off-road driving. Furthermore, its powerful gear-driven setup allows the King Yellow to take on slope inclines of up to 40 degrees! This LIMITED-EDITION version of the kit includes a pre-painted yellow polycarbonate body! 1/18 scale R/C model assembly kit. length: 478mm. Body is pre-painted in PS-19 Camel yellow, and requires attachment of accessories, application of stickers, and opening of body holes. The G6-01 chassis gives powerful 6-wheel drive in a gear powered drivetrain contained in a gearbox in the tough, slimline monocoque. 3 differential gears are built-in. 6-wheel double wishbone suspension is fitted with friction dampers. With suspension re-assembly and a separately-sold transmitter with 4WS function and R/C equipment, rear wheels can be made steerable (4-wheel steering).